This presentation technique is being produced with the combination of a photographic print and Acrylic Glass. Using a specific lamination film we have an airproof result without air bubbles. With this method we obtain, the reduction of the light reflection which is often noticeable in conventional framing techniques, increased sharpness, enhanced dynamic range. When light penetrates the acrylic glass the light perception is entirely different than that of conventional prints displayed behind normal framing glass. The result - An extremely direct image! The back is also from black or white acrylic glass, width 3mm. The hanging system keeps the image in distance from the wall, offering an exceptional feeling! Cornelia Sidiras was born in 1977 in Thessaloniki, where she currently lives and works. She has been a photographer for 14 years. She began as a photographer of excavations, and later worked as a travel, portrait, fashion, and wedding photographer. Works of hers have been contributed to Greek television series. The last five years, she has worked on the “Circle” project, and in her first personal exhibition, she will present 22 images, with the common themes of loneliness, life, love, and birth. Her inspiration is her twin sister, to whom she dedicates this exhibition. Maria Kyriazopoulou was born in 1950 in Thessaloniki, where she still lives and works. She began exhibiting her work in 1986. She is a member of the Chamber of Fine Arts of Greece and the Visual Arts Club of Northern Greece. Her work is on display in numerous locations, including: the State Museum of Contemporary Art, the Vorre Museum, the collection of George Kitis, the “Ianos” collection, the “Art” collection of Kilkis, the Department of Macedonian Thrace, the Viannou Gallery of Crete, the gallery of the Community Center of Thessaloniki, as well as other public and private collections throughout Greece and abroad. Her main private exhibitions include: 1986 and 1990 “K7”, Thessaloniki, 1986 and 1988 «DADA» Athens, 1991 «Antinor» Athens, 1994 and 2002 «Art» Kilkis, 1995 «Ianos», 2003 and 2004 «ARTOWER AGORA», Athens, 2004 «Parallel», Thessaloniki, 2006 «Epsilon», Thessaloniki, «ARTOWER AGORA», Athens, 2008, «The Gallery at the Community Center of Thessaloniki» 2008, «ARTOWER AGORA», Athens, 2010. Abroad, her work has been displayed at the Terzo Gallery in Berlin in 1993. She has also participated in over thirty group exhibitions in Greece and abroad, as well as the First Biennale of Thessaloniki in 2007. Poetry meets the visual arts. The unexpected “marriage” of two movements from different sectors of the art world—futurism manifested from literature and cubism from visual arts- give birth to the pure Russian compositional term “cubo-futurism”, along with new possibilities for these two sectors of art. One hundred years have passed since the publication of the first manifesto of Russian futurism, “A Trap for Judges” (SADOK SUDEI), and to commemorate this, the State Museum of Contemporary Art has organized a similarly titled exhibition with early works of Russian Avant Garde (1900-1915) from the Kostaki Collection of the Museum, which opens at 20:00, on February 19th, at the Monastery of the Lazarists. 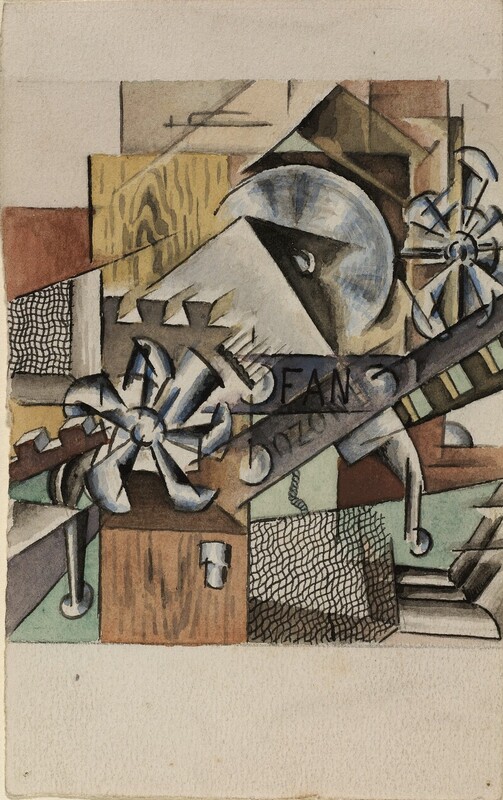 The exhibition presents early avant garde works up to 1915, emphasizing the cubo-futuristic period and the influences of French cubism and Italian futurism. All the works are part of the Kostaki Collection of the SMCA. Specific works presented for the first time include the designs and plans from the travels of Popova to Europe (France-Italy) and cubo-futuristic studies of Ivan Klioun. Also presented are early works of Natalia Gondsarova, Elena Gouro, Michail Larionof, Ivan Pouni, Olga Rozanova, Nantiezda Oundalstova, which all depict the transition from symbolism to cubo-futurism. Many works have not been previously presented to the public. The exhibition is accompanied by cubo-futuristic publications of the time, with the focus being the first manifesto of Russian futurists which circulated in 1910 under the title “A Trap for Judges” (Sadok Sudei). In 1913, the second anthology of the same name was published. The exhibition will include the viewing of films during the entire duration of the exhibition, lectures (March-April), and a special dedication marking the 80 years following the death of the Russian futurist, Vladimir Mayiakofsky. Goal driven re-creators, they share with us their visual code by spreading the fiber that joins self-portraits, private moments, and political awareness, with their photosensitive memory. The 43 works create a unity which, many times through different perceptions, confrontations, even conflicts, wishes to find a compromise between the works it is comprised of, and guide us from one image to the next by following the traces of our visual civilization. The small rooms in the courtyard of TAF, which up until 1965 were residences of citizens of the city, are now “inhabited” by photographers and their visions on the question/theme WHO WE ARE. The LIGHTROOM project, the first continually moving photographic gallery, is the new vehicle of action of Greek photography as modern art in Greece. Paris Anagnostopoulos, Nikos Vandoros, Xara Varsamidou, Lukas Vasilikos, John Vastardis, Danae Vlahou, Tasos Vrettos, Anastasia Voutiropoulou, Cathy Cunliffe, Thomas Gerasopoulos, Gerasimos Domenikos, Christopher Doulgeris, George Zaharopoulos, John Theodoropoulos, Jonnek Jonneksson, Athena Kazolea, Panos Kiamos, John Kolesidis, Aspasia Koulira, Maro Kouri, Pepi Loulakaki, Jordan Makarof, Theodoris Markou, Nikos Markou, Kostas Masseras, Stefania Mizara, Dimitris Mihalakis, George Moustafis, Alexandros Beltes, Tina Bonatsous, Kamilo Nollas, Natasa Papazoglou, Nikos Pylos, George Prinos, Andrea Pliatsika, Despina Spirou, Panos Skouloudis, Spiros Staveris, Marilena Stafilidou, Dimitris Triantafyllow, Pavlos Fisakis, Leonidas Halkidis, Athena Hroni. Because of the wonderful and methodically built friendship between Nikos Alexiou and Nikos Triantafyllou, the Lola Nikolaou Gallery will present selections from their recent works in the exhibition opening on February 9th, 2010. The works of art of Nikos Alexiou and Nikos Triantafyllou are, above all, a continual dialogue, without words, of each artist with his life. With a poetic style, discussing loves, friendships, and emotions, using modern and hand-made techniques, the two friends compose their own personal mythology. Myths which produce reason, and reason that becomes an action of Love. Some of these are forerunners of extraordinary meetings, and are made, one would say, with the fine emotional tones of a truly moving relationship between Art and Love. Opening: Tuesday, February 9th, 2010, 7 p.m. This is an exhibition with a retrospective character supervised by Katerina Koskina – Syrago Tsiara, in cooperation with the Public Gallery of Larissa-Y.I. Katsigra Museum and the John F. Kostopoulos Foundation. In the exhibition, over 100 works of Athena Tacha are presented, substantiating, for the first time in Greece, her important work in sculpture and conceptual art. Works, incorporated by over 45 architects – sculptural configurations of public spaces (squares, recreational areas, fountains, and public spaces with multifaceted functions) - which have been implemented in many American states, such as Florida, Ohio, Arizona, Alaska, Philadelphia, and New York, from 1970 until today. Examples of her work have been presented in Greece only in group exhibitions in Thessaloniki and Larissa (Dromologio II, Genius Loci- Thessalian Creators, Visual Center of Modern Art of Larissa, Dromologio IV, Citizens of the World, Visual Center of Modern Art of Larissa (2000), Modern Odysseys, Thessaloniki, State Museum of Contemporary Art (2001), Disguises, Femininity, Virility and Other Certainties, State Museum of Contemporary art, (2006-7). Parallel with her “public” works, she works on a series of works which she expands mainly through conceptual projects – some of which continue up to today – with the general area of study being the body (heredity studies, self-portrait studies, etc.). Also, not so well-known is her research on art history and her diligent organization of exhibitions in America. Visitors to the exhibition will have the opportunity to view over 100 of her works. From these, the public ones will be exhibited in large dimensional photographic reproductions, as well as the early conceptual works focusing on the body and the more recent, dealing with elements of nature. The exhibition also includes photographic reproductions of her sculptures, authentic sculptural work, sculptural designs-architectural large scale designs, photographs from temporary structures, models of completed works, and current movies concerning the interconnected political and social character, as well as prototypes, in situ, which bear witness of Athena Tacha’s journey over 40 years in the private and public sector. The exhibition will travel to Larissa from April 22nd until the end of September, 2010. The Thessaloniki Museum of Photography presents its second exhibition of the cycle “The Four Elements of Nature and Man”, which opened last year with the exhibition “Water-Currents”. The photographic exhibition “Earth: Traces” is organized by the Thessaloniki Museum of Photography in cooperation with the Swiss bank Pictet and Candlestar (London), producer of the Pictet Award. The curators of the exhibition are Gabriel Bauret and Vangelis Ioachimidis. The exhibition is composed of 100 works of 25 artists from 19 countries. Darren Almond (Great Britain), Christopher Anderson (Canada), Sammy Baloji (Republic of Congo), Edward Burtynsky (Canada), Andreas Gursky (Germany), Naoya Hatakeyama (Japan), Nadav Kander (Israel), Ed Kashi (U.S.A.), Abbas Kowsari (Iran), Yao Lu (China), Edgar Martins (Portugal), Chris Steele-Perkins (Myanmar). In the department of the Prix Pictet, there are works which display areas from every corner of the earth, as well as changes resulting from its urban and geopolitical exploitation. Antonio Biasiucci (Italy), Elina Brotherus (Finland), Simon Burch (Ireland), Thibaut Cuisset (France), Cédric Delsaux (France), Romain Girtgen (Luxembourg), Lisa Nguyen (Vietname), Pétur Thomsen (Iceland), Nikos Danielidis, Hector Dimisianou, Hara Kakaroucha, Dimitri Kilalou, Effie Tsakraklidou (Greece). Touched upon, is the subject of history, globalization, and the directed beauty of the environment itself as a primary source of creation. The organic relationship which connects the artists with the earth and the visual source they choose to observe what surrounds them, both serve as elements which characterize the work and its text. Nikos Vandoros, Anastasia Voutiropoulou, Enri Canaj, Cathy Cunliffe, Thomas Gerasopoulos, Hector Dimisianos, Gerasimos Domenicus, Stratos Kalafatis, Giorgos Makkas, Nikos Markou, Dimitris Mihalakis, Tita Bonatsou, Elisabeth Moraki, Nikos Pylos, Spyros Staveris, Alexandros Filipidis, Paulos Fisakis. The Thessaloniki Chamber of Commerce and Industry (TCCI) presents an exhibition with the works of three Greek artists: Kostis Velonis, George Makkas, and Marilena Stafilidou. The artists photograph patients who suffer from rheumatoid arthritis, in an effort to record, each in his own style and viewpoint, the daily routine of these patients. Their efforts are not solely for the purpose of documentation, but rather artistic in nature through the use of black and white realistic works, as well as abstract compositions. The purpose of the exhibition is to describe the disease, which, after pharmaceutical action, will comprise a “museum extract”. The exhibition will be presented for the first time at the Athens Concert Hall (14-16/11/09). The three artists, Marilena Stafilidou, George Makkas, and Kostis Velonis, all confronted rheumatoid arthritis, each with his own perspective and through his/her own means of photography-with a realistic, plastic, and abstract style. This project is composed of the dynamic colour portraits of Makka, where the difference between the ill and healthy patient is deciphered only in the accompanying text, the plasticity of Stafilidous’ style, who focuses on faces, appendages and their movements-even if the movement is only hinted at through inactivity-and, in the end, the abstract collage conception of Veloni, who uses photographic means not to show, as usual what he observes, but as the last layer of a composition in which is revealed the dynamic core, the essence of it all. With the kind sponsorship of Roche (Hellas) A.Ε. The exhibition of Philip Tsiaras entitled “The Super Real” is extended until December 13th, 2009, and is organized by the Thessaloniki Museum of Photography. It involves the first big retrospective photographic exhibition of the artist, who is an internationally known artist of Greek heritage, who lives and works in New York. Along with the exhibition, visitors have a chance to get to know the artist through the publication of the Thessaloniki Museum of Photography entitled “Philip Tsiaras: The Super Real 1971-2009”, which is composed of texts by Vangelis Ioachemidis, Andreas Bee, Sirago Tsiara, and the well-known photography critic, Allan D. Coleman. The rich photographic material of the book is divided into five sections (The Faces, Movement, The Self, The Family, and Places), as is the exhibition. The exhibition, curated by Vangelis Ioachemidis, is manifested in the context of the 44th Demetria Festival of Thessaloniki, under the supervision of the Hellenic Culture Organization, with the support of the Municipality of Thessaloniki and the company “Attiko Metro”. In the exhibition, over 200 chosen works are selected from important collections of the artist from 1971 until today, covering the entire spectrum of his photographic material. The choice of works is based on two central ideas: the way the artist explores his photographic means-through narration, video, and his own innovative interferences, as well as the way he builds his identity, while trying to unite his various cultural experiences-his familial and social experiences. During the exhibition, a film is shown which is dedicated to the work and career of the artist. The Greek-American Philip Tsiaras, was born in 1952 in New Hampshire, U.S.A. He studied music and comparative literature at Amherst College. He was the assistant to Lucas Samaras. His artistic work is composed of photography, painting, poetry, sculpture, ceramics, and glass. From 1974, he has had over 75 private exhibitions in various institutions throughout the world, including: Seattle Museum of Art, Center of Contemporary Art, Thessaloniki, Mannheimer Kunstverien, Mannheim, Bernier Gallery, Athens, Studio Palazzoli, Milan, Shea & Beker Gallery, New York, Margulies/Taplin Gallery, Miami, Tegnerforbundet Gallery, Oslo, Museum Santa Apollonia, Venice, Gallerie Dominion, Montreal, Newport Art Museum, Rhode Island., Villa Reale, Monza, The Currier Museum, N.H., Spazio Cavallieri di Malta, Cycladic Gallery, Syros, International Exhibition of Contemporary Art, Istanbul, Neou Frouriou, Corfu. More recently are the exhibitions: «Philip Tsiaras, New Work» Istanbul, «Glassy Sultans» Bodrum, «Mediterrania» Idaho, U.S.A. (2008), and his participation in the Art-Athina 09. He has also received many awards, including: The American Academy Award for Poetry, The Thomas Watson Fellowship, New York State C.A.P.S grant, National Endowment Grants for Arts, distinction for the Blickle Stiftung International Photography Prize, Germany, and The Generali Assicurazioni Gold Metal Award for “Civilita”, Venice. Works of his can be found in company, private, and important museum collections, including the Metropolitan Museum of Art. Twenty books and catalogues are dedicated to his work. Important to note are books published by Electa, Mondadori and Contrasto books. He lives and works in New York. 130 chronologically ordered works of the architect and professor, Dimitris Fatouros, will be presented at the Benaki Museum from September 30th, until November 1st. According to the curator of the exhibition, Professor Loei Papadopoulos, the organization of the exhibit is very important, because it presents the creation of modern architectural identity through the eyes of an important innovator, who deals with architecture as if it were the human body. «Architecture, as a continual creation of forms of life of human society, searches for the continual and discontinual with its journeys, and unfolds its own initiatives through the circumstances of today’s new reality», says Mr. Papadopoulos. Dimitris Fatouros, who finished his architectural studies in 1952 at the National Technical University, continues to participate in the international dialogue for architecture and the training of architects. In his career, he encountered art, every day politics and every day life, as well as discussions concerning the foundational situations of symbiosis and happiness of human society. Large and small buildings, texts concerning expression and demands, analytical proposals, initiatives for special actions, insistence in the dialogue of the multiplicity of architecture and its reason, unbreakable composition of the poetic and scientific world, as a creative suggestion of technological effusion. Like this quest, the exhibit is a suggestion in continual process. In collaboration with the Spanish Embassy in Athens, the Teloglion Foundation of Art, the Spanish-Hellenic Cultural Center of Thessaloniki, Federico Garcia Lorca, the Cervantes Institute, the Dali Foundation, and the Miro Foundations, as well as the Thessaloniki Museum of Photography. An exhibition of photography and printed material from the Dali Foundation and the Cervantes Institute, and the first departmental presentation of the Spiteri archives from the Teloglion Foundation. The idea for this exhibition was formed in 2004, the year in which the 100th birthday of Salvador Dali was celebrated. The exhibition shows a less well-known side of Dali as a writer, as well as a reader, his relationship with books being a source of inspiration and knowledge, as well as a reference point. (...) The personal library of Salvador Dali, which is kept at the Center for Dali Studies, at the Gala-Salvador Dali Foundation, is composed of books concerning various subjects: art, architecture, literature, philosophy, politics, history, alchemy, medicine, physics, mathematics, biology, biochemistry, natural sciences, dictionaries, and encyclopedias. Dali was a fanatic reader. From his adolescence, he was an anarchist and a romantic. Dali’s books, which reached our hands, number around 4,337, 228 of which have his notes and drawings in them. (...) The exhibition includes a series of photographs, in retrospective, chronologically, as well as subject-wise, that have to do with Dali, Gala, Gala and Dali, and always, either directly or indirectly, with the common theme of books—books from their library, many of which show Dali’s influence. The photographs, the basis and root of this exhibition, help us delve into a private world. They show another world as well, one more public, in which Dali is shown searching for the appropriate angle to “pose” in front of the lens in order to attract the most attention, a Dali who acts and wants to challenge us. A characteristic example is a snapshot in Coco Chanel’s atelier, in her country home “La Pausa”, in Roquebrune, France. In this entire collection, the photographs which are most important are those that show the atelier of the artist, the place where he created and that inspired him. Also important are his photographs with books, his or foreign, and the library at his house in Port Lligat, a wooden library, placed high above the fireplace which reaches from one end of the wall to the other. (...) This exhibit confronts the books as a symbol of the reformational power of artistic creation, and as a source of literary inspiration, and through the relationship of Dali and Gala with their books, we can, in turn, learn a bit more about them as individuals. (...) Salvador Dali is always one step ahead: he doesn’t just gain knowledge while reading, but he becomes part of the book, and often, imposes his opinion in notes, so that the book that passes through his hands is transformed into an equivalant of his creative ease. He implements this parallelism. Dali is not confined to the role of a simple reader, he is an exceptional writer and participates in the imaginative or scientific world inspired or presented by books. Selections from the text of Montse Aguer Teixidor, Director of the Center for Dali Studies of the Gala-Salvador Dali Foundation. The exhibition of Mirό of Majorca, a collaboration of the Teloglion Foundation of Art and the Pilar and Joan Miro of Majorca Foundation, presents one of the largest exhibitions of the artist in Greece. A large collection of works of Mirό (over 400) cover all of his themes, such as: painting, sculpture, drawings, sketches and sculptures for public artwork, ballet, music, and material for King Ubu of Jarry (who had special importance for Mirό). The model of the Sert workshop, along with documents, notes, furniture, etc, create an atmosphere reflective of the internal side of his creative thought. The works date from 1908 (his only surviving early topography) to his death in 1983. Mainly, the work of a mature Mirό of Majorca is presented, which was created in the workshop designed for him by his friend, architect Josep Lluis Sert in 1956. This workshop delineates a chapter in the life and work of Mirό because it is here that he re-examined his work up until then, and decided to make a new start. It is a period reflective of his unlimited independence and quest for knowledge. Following his experience in America and his acquaintance with the painters of the movement of Action painting, we find Miro living in the climate of European Art Informel. He is influenced by pre-historic cave paintings, Middle Eastern art, the folk tradition of Catalonia, his home country, and dodecaphonic music. His thirst for breaking new ground is witnessed in his visual dialect- spots, splashes, flow, graphics, scratches, stitches, nails, ropes, using random objects, violent gestures, and research with a greater passion of the expressionism of materials. Biomorphic and surrealistic themes—symbols, woman, birds, landscapes, the sky, the sun, the moon, constellations. As in the case of the exhibition Suite 347 of Picasso, the Spiteri Archives offer, in the case of Miro, rich archival material in the form of information, interviews, photographs, articles and publications in French and Greek press of the period, where opinions and critiques of important intellectual persona, as well as opinions of the artist himself, concerning his work, art in general, and the world in general, are presented. The exhibition of Μirό at the Teloglion coincided with the Movement of Five Museums (5M), a joint effort of five museums of Thessaloniki, the Archaeological, the Byzantine, the State Museum of Contemporary Art, the Macedonian Museum of Contemporary Art, and the Teloglion Foundation, to work together to promote culture in Thessaloniki. So, at the State Museum of Contemporary Art at the port, in the exhibition “Workshops of Joan Μirό”, a large number of works will co-exist from the mature period of Miro, with a substantial example of current productions of workshops of Majorca from 40 new remarkable artists, awarded by Sotheby’s. Also, a series of photographs by the great photographer who immortalized Miro at work, Francesc Català-Roca, will be exhibited at the Macedonian Museum of Contemporary Art, along with the symbolic hospitality of one of Miro’s paintings. In a corresponding gesture of cooperation, the Archaeological and Byzantine Museum will also each exhibit a painting by Μirό. The distribution of the Miro exhibition throughout the city was completed in cooperation with the Municipality of Thessaloniki and the Dimitria, which house, along with the Miro exhibition, other cultural exhibitions, including music, literature, gastronomy, substantially supporting the relationships of cultural exchanges. The exhibition “Miro of Majorca” is presented under the guidance of the President of the Greek Democracy, Mr. Karolos Papoulias and the Spanish Embassy in Athens. Only four years since the first presentation of Colour Consulting Group with a company identity that accompanied us, introduced us, and made us known, we decided it was time for a renewal. This project was undertaken and completed successfully by Be Nice. "The three first letters of the logo are characteristically borrowed from the form of a drop of colour, an element completely and utterly tied to the technology and services provided by the company. The dynamic and professionalism of CCG is exemplified with various applications in an almost propaganda-like depiction of the faces of its protagonists. By showing their faces, something which might seem over-the-top in another project, we emphasize that the success of a company is something which is based on its personal approach to professionalism and responsibility.